Twenty-two years on from Steven Spielberg’s masterpiece JURASSIC PARK and those dinosaurs still scare the life out of me! Last night I caught the exhilarating, frightening and down-right entertaining fourth instalment of the infamous franchise, JURASSIC WORLD. Colin Trevorrow has kept every bit of Spielberg brilliance alive with this feature, and made it just as memorable as the original. 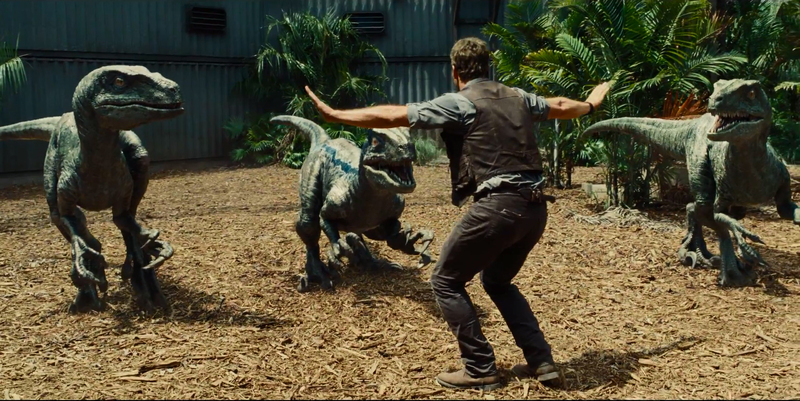 After the events of Jurassic Park, Isla Nublar is now a fully functioning dinosaur theme park known as Jurassic World. Owned by the imaginary Mr Simon Masrani (Irrfan Khan) and run by the ambitious and figure-focused Claire (Bryce Dallas Howard), the worldwide attraction is always innovating in order to keep visitor numbers high. 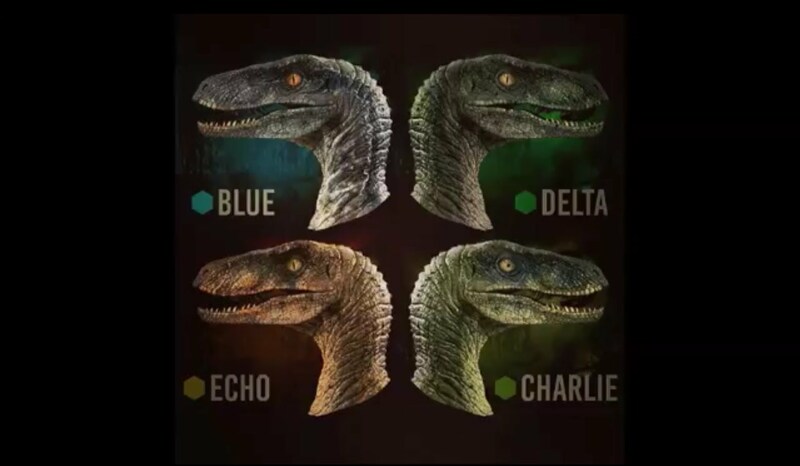 Behind the scenes, the “lab team” have been creating a new breed of dinosaur, expected to fascinate, excite and scare future visitors of Jurassic World. 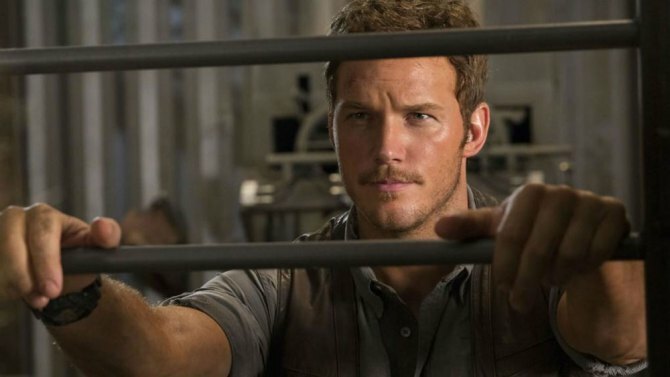 With Claire’s control team and velociraptor-trainer Owen (Chris Pratt) unaware of the complexity behind a new hybrid dinosaur, and an escape inevitable, how will they protect the island of visitors? This believable development of a theme park, trying to hold onto its declining audience, draws parallels with the theme parks we know and love today, with the major difference of course being its pre-historic inhabitants. 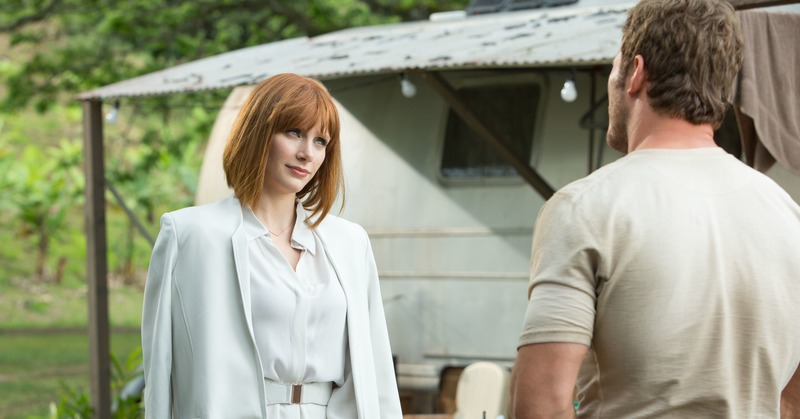 Much like the original film, JURASSIC WORLD is complete with a younger man, woman and children leading foursome, which the viewer relates to in a variety of ways. Chris Pratt (Guardians of the Galaxy) plays Owen, the experienced trainer of the Velociraptor quadrant of the island, where they are intuitively teaching the raptors to listen to and work alongside humans, rather than killing them like we saw in the first few films (remember that terrifying kitchen scene in JURASSIC PARK?!). Owen, one of the few decent men left in the development of Jurassic World, understands the importance of the relationship between man and (genetically-created) dinosaur, rather than treating them like lab rats. Incorporating the sarcasm and wit of Jeff Goldblum’s Ian Malcolm and the dedicated heroics of Sam Neill’s Dr Alan Grant from the original feature, Chris Pratt undoubtedly plays the hero of this film, appearing as the majority of critics’ only strength of the film, which I personally disagree with. He truly showcases his potential to play a major part in the potential re-make of INDIANA JONES. Bryce Dallas Howard (Spider-Man 3, The Help) plays Claire, a determined and narrow-minded professional who hosts her two nephews Gray (Ty Simpkins) and Zach (Nick Robinson) at the theme park for the weekend. 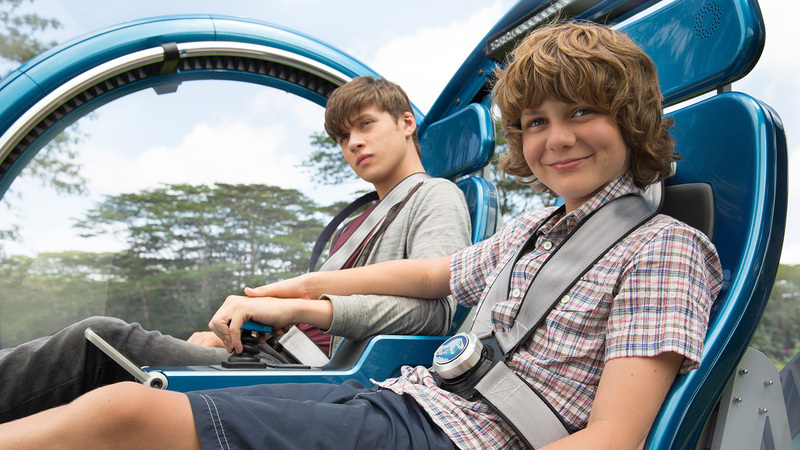 Gray, the younger of the two boys, is fascinated by everything dinosaur and cannot wait to explore the theme park, while Zach is ready to move on from home life and start college to get away from his parents’ failing marriage. The relationship between these two develops throughout the film, as does Claire’s chemistry with the charming Owen. The brothers bring a more knowledgeable young duo to the screen. With a better understanding of dinosaurs, their fear is less trivial than in JURASSIC PARK, and therefore we have less “What the Hell? !” moments to witness, such as when Lex Murphy shined the torch in that truck, but equally as scary scenes to endure. When all is said and done about the story and the actors however, the main attractions of these films are undoubtedly the dinosaurs! In a modernised Jurassic world, the herbivores are every bit as beautiful as they originally were, but the destructive nature of the carnivores has been genetically modified, controlled and limited. 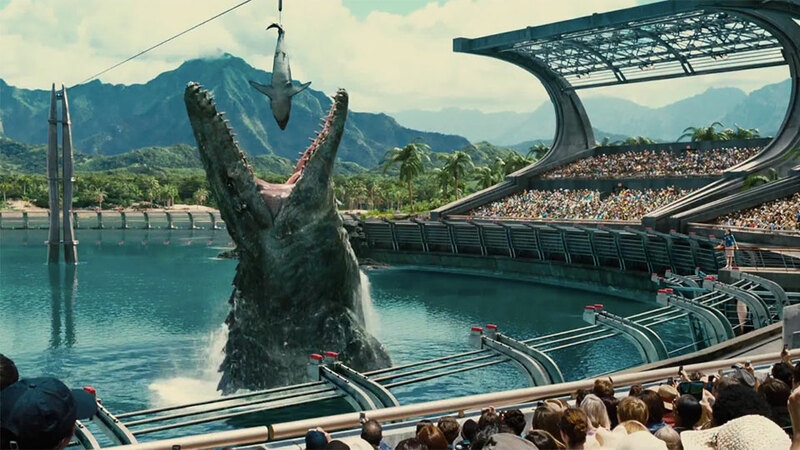 As a Killer Whale or Dolphin jumps and performs for fish at Sea World, the Mosasaurus jumps for great white sharks. Flying reptiles are now kept in an aviary and velociraptors are named and trained by humans on a daily basis. Once again, it is a blockbuster this year which deserves the IMAX Experience! By spending a few extra pounds, you are not just watching Jurassic World, but you are a part of it! Showcase Cinemas Bluewater has now given me two forms of escapism this year and I do not doubt that I will be escaping to the world of more superheroes or even terminators in the coming months. Overall, JURASSIC WORLD was an edge of your seat, nail-biting and engulfing cinematic experience which transported me back to my childhood and left me longing for more. It has been very harshly criticised as being too cheesy and having a weak story, but personally, it takes everything great from the original film and simply modernises it for us. 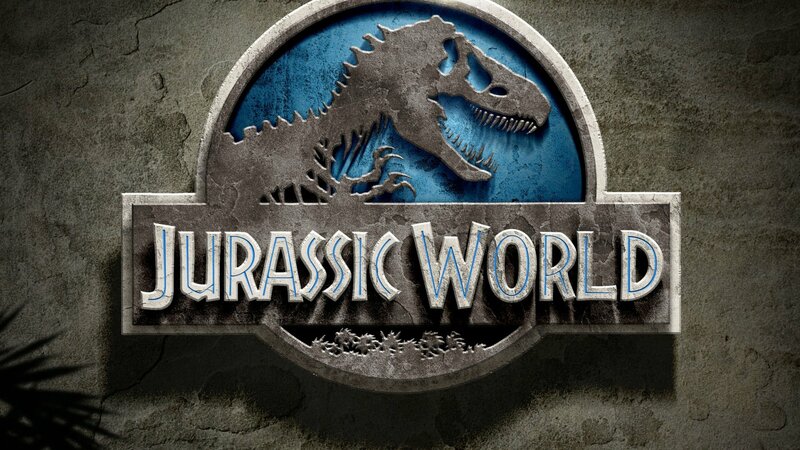 I’m sure Richard Attenborough’s John Hammond (The creator of Jurassic Park) would have been proud of the park’s development, to a certain extent, and I’m positive that Steven Spielberg (an executive producer of this film) is satisfied with the rejuvenation of his 90s classic! Recommendation: Jurassic Park fan?! Get ready for this exhilarating follow on! Once again – PLEASE give this a watch in IMAX 3D! Breath-taking and beautiful piece of cinema!